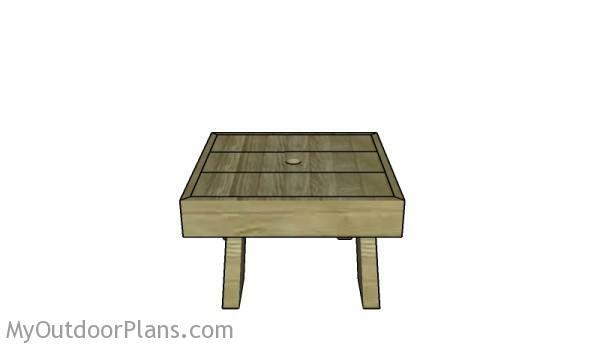 This step by step diy woodworking project is about small side table plans. 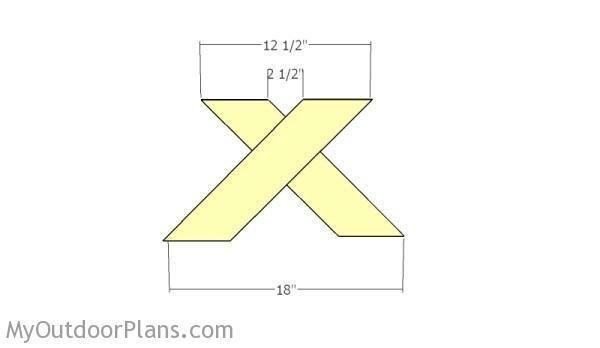 This article features detailed instructions for building a small side table with x- shaped legs. 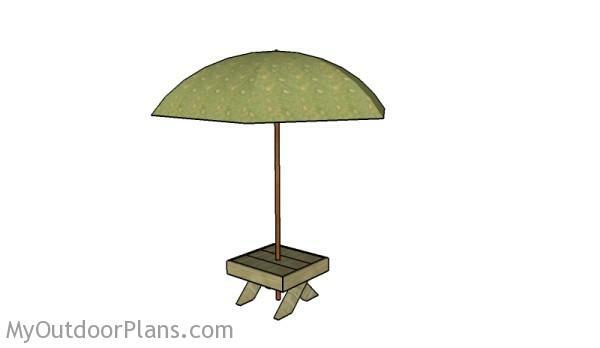 This is an ideal project is you want a small stand for your outdoor umbrella, when relaxing on your lawn chair. This is a simple project that should take just a few hours to build. Take a look over the rest of our woodworking plans, if you want to get more building inspiration. The first step of the project is to build the frame of the table. 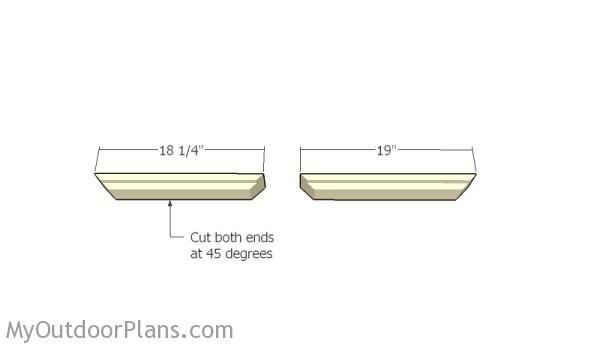 Therefore, take two pieces of 2×4 lumber 4′ long (or use one 8′ long) and make a 3/4″x3/4″ rabbets to the top edge, as shown in the diagram. You can use a table saw or a router saw to get the job done in a professional manner. 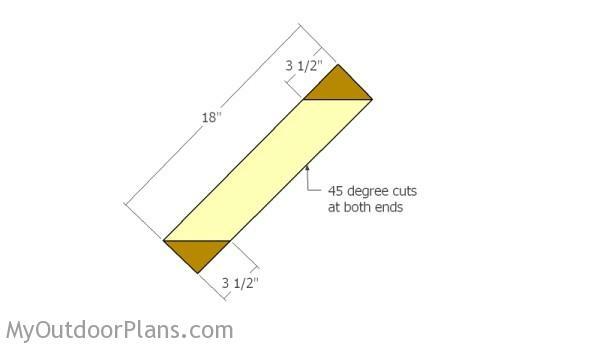 The use the miter saw to make 45 degree cuts to the board, as shown in the diagram. Assemble the frame for the side table. Align the edges with attention, making sure the corners are square. 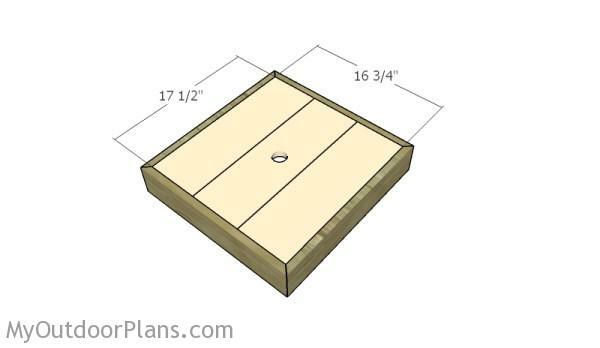 Use 2 1/2″ brad nails to lock the slats together. In addition, add glue to the joints to enhance the rigidity of the structure. Attach 1×6 slats to the frame. Place the slats equally spaced, so that there is a small gaps drainage gaps between the them. 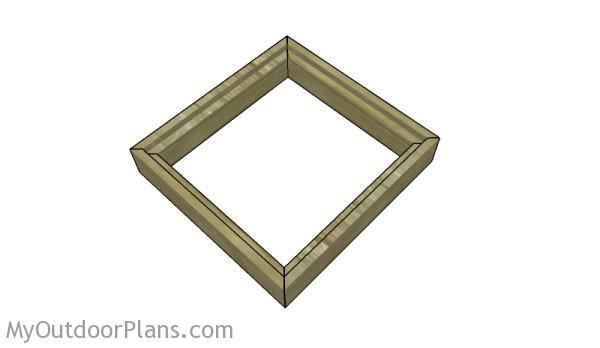 Use 1 1/4″ brad nails to secure the slats to the frame. In addition, drill a 1 1/2″ hole in diameter in the center of the table. Mark the center by tracing the diagonals. Build the legs for the table from 2×4 lumber. 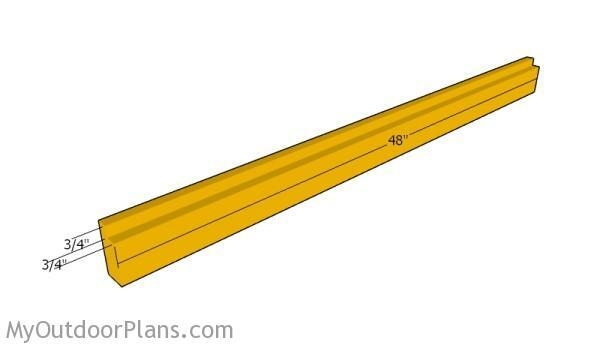 Cut both ends of the legs at 45 degrees. 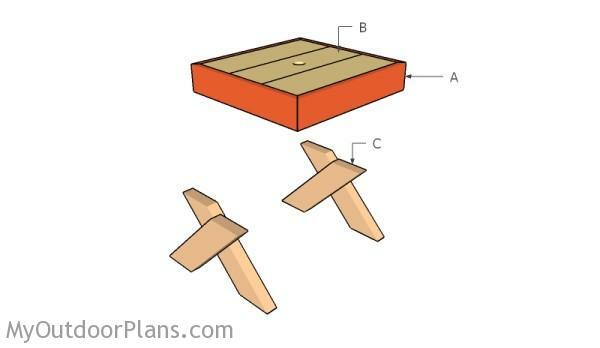 Assemble the x-shaped legs for the table, as shown in the diagram. Drill pilot holes and insert 2 1/2″ screws to lock them together tightly. Fit the x-shaped legs to the frame of the table. 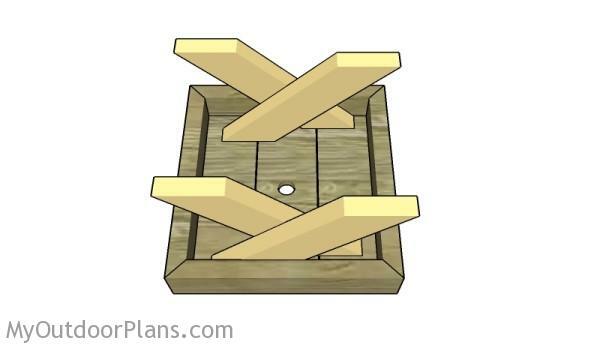 Center them into place and lock them to the frame using 2 1/2″ screws, from the inside. In addition, lock the legs to the tabletop with 1 1/4″ screws. Remember that is very easy to adjust the height of the table by making the legs longer. You can also adjust the size of the tabletop and the angle at which you cut the legs. This woodworking project was about small table umbrella stand plans free. If you want to see more outdoor plans, check out the rest of our step by step projects and follow the instructions to obtain a professional result.